Great way to prepare for the competitive examination is to read the right study material. Aspirants sometimes find it difficult to compile the knowledge of one subject from different books. It certainly creates confusion and a waste of time. There is a perfect resolution for all these issues which is competitive exam magazines by Pratiyogita Darpan. Each magazine is a complete compilation of different subjects’ i.e. clear and well-structured knowledge at one stop. It not only becomes easier for the students to grasp knowledge but also save a lot of time and money. Information of each topic is given in a well-defined form, along with the sample questions which will help to practice. Indian History Medieval India series-16 is an amazing exam knowledge base for the students. 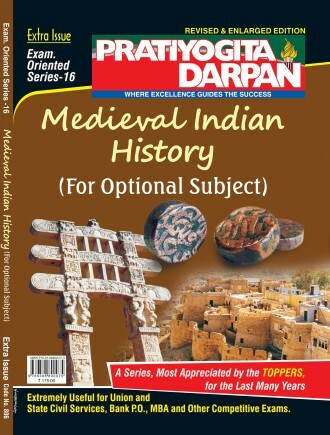 This magazine by Pratiyogita Darpan is proficient in providing the vast information about Rajupt Age: from 750 A.D. to 1200 A.D. and consists of sub topics like Origin of Rajputs and prominent Rajput Dynasties, Rashtrakut Dynasty, Gurjar Prathiharas, Pala dynasty, Tripartite struggle, Other Prominent Rajput states, Political Condition of the Rajputs, Political Views and institutions etc. Medieval Period: from 1200 to 1707 has sub topics like, historians of medieval India and their historical texts, foundation of Delhi Sultanate in North India, Circumstances and causes for the establishment of Muslim rule, Muslim Impact on Indian Society, Khalji empire, Tughalq Dynasty, Ghiyasuddin Tughlaq, Mohammed-Bin-Tughlaq, New political policies and administrative principles of state under Mohammad Tuglaq etc. Vijaynagar Empire, Bahamani state has sub topics Religious Movements of 15th and 16th centuries, Sufism of Mysticism, Bhakti Movement-Nature and relevance of the saints of the Bhati Movement, Role of Vaishnava Revivalists and their work, the emergence of regional states in the fifteenth and early sixteenth century. Foundation of Mughal Empire in North India has sub topics like Jahangir, Shajahan, and Aurangzeb etc. Towards the end a lot of terms, objective questions are given along with the vast knowledge about the Maratha Empire. After reading this data bank aspirants will be confident to excel in the examinations.